As summer winds down, my SIL and BIL in MN are preparing for harvesting their fields of corn and beans. 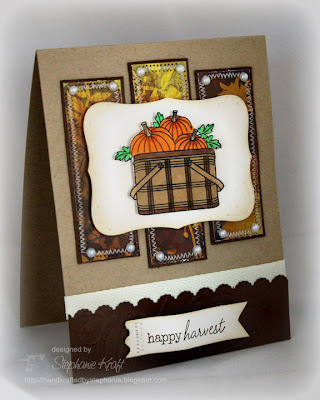 I made this card for them, as it never hurts to send happy thoughts for a bountiful harvest. I used Julee's Mojo Monday Sketch #103 and more Basic Grey Indian Summer patterned paper. I know when I show this to Dan, his comment will be, "but they don't harvest pumpkins". He always tries to keep me on my toes with his quick wit... LOL! I think they will get the idea just the same! Accessories: Labels Eight Nestabilities (Spellbinders), Swiss Dots and Pumpkin embossing folders (Provo Craft), Markers (Copic), Scalloped Scallop border punch (EK Success), Pearls (Queen & Co), Twill, Iridescent Gold Glimmer Mist (Tattered Angels), Foam tape, Thread, Sewing machine. Very very pretty. Loved it :) Coloring is ab fab.